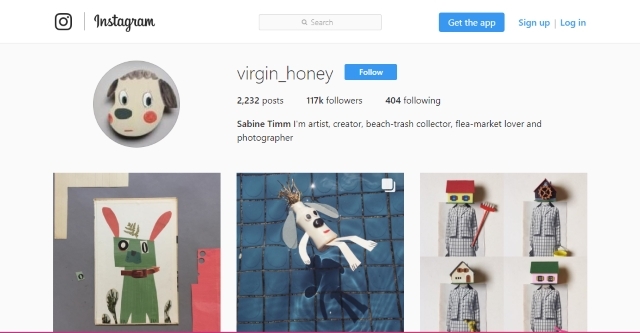 I've been following a German artist called Sabine Timm on Instagram for a few years now. She goes by the moniker @virgin_honey over there, where she shares the coolest, quirkiest art you'll ever see - mostly made from found items. A while back, I wrote a piece about Sábha. How she has no real interest in proper toys and much prefers to make her own 'toys' out of things she finds. I showed Sabine's Instagram feed to Sábha one day, knowing she'd love her style as much as I do. She spent ages scrolling through the pictures and loved discovering that she recognised many of the components of Sabine's pieces. 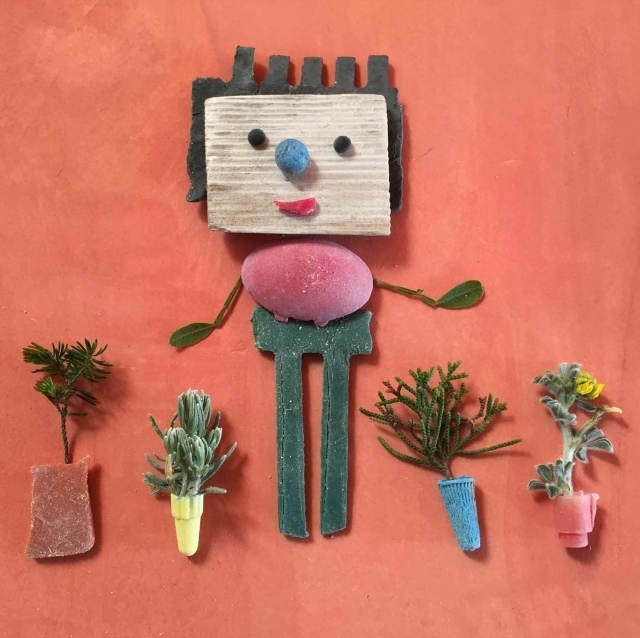 Things like ice-cream spoons, old paintbrushes, random bits of plastic, flowers and even food. She was hugely inspired by the work, and I think, a little bit amazed that a grown up - a REAL artist - made things just like she did. ...and then, the innocence of a child and the magic of the internet collided and something wonderful happened. And Sabine wrote back. And was just so completely lovely. Sábha was absolutely thrilled. 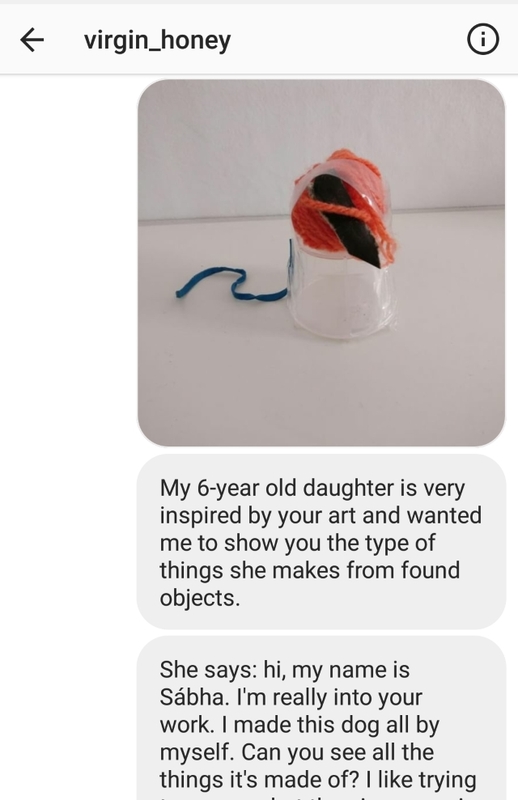 A REAL artist was sending her messages, and complimenting her work. I mean, how exciting is that?! Sabine then sent her some beautiful postcards of her work and a box of found items collected especially for Sábha. It was one of the best presents she's ever received, I can tell you. Honestly, you could give this child an entire collection of Beanie Boos and a feather and she'd probably be more excited about the feather. 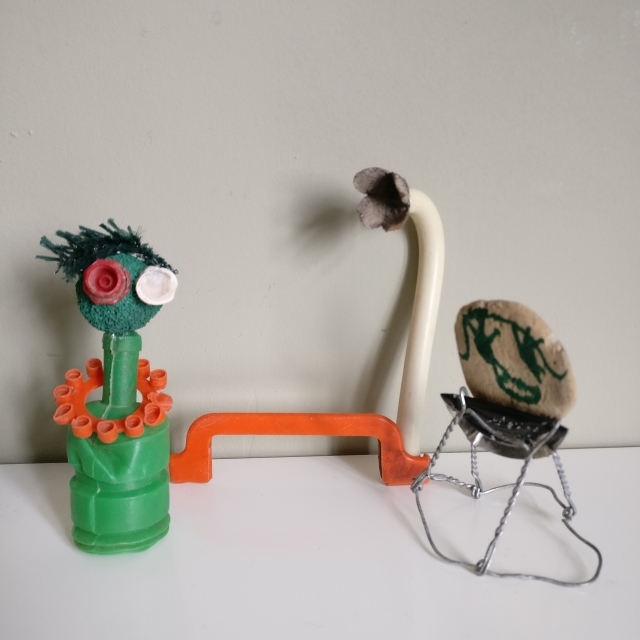 Sábha created this funny couple from the finds Sabine sent and we took a walk on the beach to collect some treasures to send back. Another of Sábha's passions is nature and the environment so combing the beach to find random bits of plastic ticks two boxes for her - making the beach safer for wildlife and collecting junk! We sent off the parcel and shared pictures of her creations with Sabine and they were very well received. I'm so grateful to Sabine for taking the time to not only respond to Sábha's initial message, but to validate her as an artist in her own right. It would be easy for an adult to dismiss what she makes as rubbish (which it technically is!!) or 'just kid stuff'... and possibly to think that it's a bit gross to be collecting junk (I do have to remind her to wash her hands about 500 times a day to be fair) but I think she's found a kindred spirit in Sabine. Confidence is such fragile thing and although, as parents, we do our best to build it up in our kids, somehow the wider world will always have a bigger impact on making or breaking it. The kindness of people like Sabine is so important and has a huge impact. I know that Sábha will remember this interaction forever. She regularly asks if she can 'check what Sabine's been making'. She's also started art lessons in a local gallery (Lile has too) and her schoolbag is constantly full of 'treasures' she has great plans for. I'm not expecting her to decide to become an artist or to continue to make things like this forever, but I hope she always feels confident enough in her creativity and ingenuity to enjoy art for art's sake and to value the joy and the connections it can bring. Sadhbh I didn't know what to expect when I opened this, nearly have a tear in my eye it's such a lovely story. It's fabulous that Sabha is so creative. May it last forever. Thanks so much Laura. The title is a little... ahem... unusual, but I'm glad you opened it anyway! So often I am amazed at the kindness of others over the internet. This is lovely. A meeting of minds, a generation apart. That's exactly what it is, Tric. It is amazing indeed.